Please Note: We are collecting a parking fee of $10 per car per day. 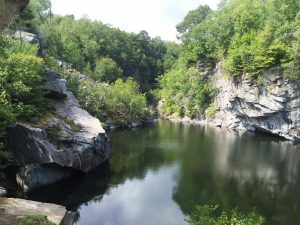 The Historic Quarry and Forest was the result of an extraordinary community fund-raising campaign to save a 300+ acre parcel of primarily wooded land from industrial development. To prevent detrimental impact on the site and the community, local citizens donated money to enable the Becket Land Trust to purchase the property and open the site to the public for recreational enjoyment. We welcome your membership, donations, and active participation. DONATE: To make a donation on-line using a credit card or PayPal click on the button below: (we are a 501c3 non-profit and all donations are tax deductible). Consider becoming a sustaining member and select the “Make the recurring” option on the PayPal form. If you would prefer to donate by check go to the donation page for more information. VOLUNTEER: Volunteers are always needed for various jobs throughout the year. MEMBERSHIP: Members receive e-mail notification of special events, educational programs, exhibits, guided tours and volunteer work days. Please join us. We are facing similar problems. PLEASE REMEMBER: Take ALL your trash with you. Leave nothing but footprints. No Fires. Respect other visitors. Help us keep this place special. Since gaining popularity on Instagram and travel sites, the Blue Hole in the Catskills has been overrun by crowds and trash. Now state officials are trying to protect it. We are collecting a parking fee of $10 per car per day. Parking along the roads abutting the Land Trust property is not permitted and cars parked on the roads will be ticketed and towed by the Becket Police Department. There is a private security officer on duty during the hours the property is open to the public. the “Make the recurring” option on the PayPal form. If you would prefer to donate by check, please print and complete the donation sheet available as a Word Document or as a .pdf Document. 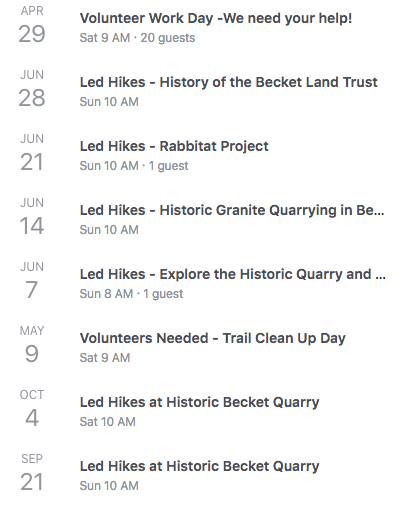 © 2019 Becket Land Trust.